This is a condition which occurs in males only. It can occur at any age from 20 years to old age. The exact cause of male pattern baldness is not known. What is known is that it is linked to genetics and also to testosterone levels. There is undoubtedly a genetic component to male baldness - it was previously thought that this was inherited mainly from the mother's side but it is now known that the genes for baldness can be inherited from either mother's or father's side. It is also known that it is linked to testosterone since anti-testosterone drugs can cause remission of baldness. But how exactly it is linked is not known, since there is no known difference in testosterone levels between those who are balding and those who are not. Balding begins typically be receding of the hairline. Initially the hairline recedes in the temporal region, making an M-shaped pattern. Gradually the middle portion is also lost, forming an inverted-U pattern. Besides this, there is also loss of hair at the crown. In some people crown loss may be the dominant or sole pattern, while others may have only frontal loss without loss at the crown. The hair does not actually fall out in MPB. Balding persons often have great anxiety when they see hairs on the floor of the shower or hairs on the pillow and tend to develop a habit of checking closely for any signs of hair loss, but in fact such hair loss is not related to their balding. In MPB or male pattern baldness, the follicle or the root of the hair gradually becomes smaller and thinner, and the hair also becomes finer and shorter. Thus gradually more and more scalp becomes visible in the balding areas. There is no loss of hair, instead there is loss of quality of the hair as it becomes thinner and shorter. The person gradually finds that he does not have to cut his hair in the balding regions. Even on the completely bald areas of the scalp in a severely bald person, if looked at with a magnifying glass, it will be seen that there are still some hairs, but they are very fine and almost invisible to the naked eye, and they are also very short. Females also develop baldness, but it is much less common than males. In females though the balding pattern is different. Females have diffuse decrease of hair all over the head instead of in a specific pattern. This is called Female pattern baldness. Female pattern baldness is also genetic, but not directly related to hormones. Telogen Effluvium: This is caused by any trauma or stress - such as an acute period of mental stress, acute illness like infections or high fever, major surgery, etc. This causes hair to go into the resting phase. This causes sudden loss of large amounts of hair about one to three months after the event. It is this that causes sudden increase of hair on the pillow or in the shower. Medications: Several medications like those for high BP, diabetes, heart disease or cholesterol can cause hair loss. Iron metabolism: Deficiencies in iron metabolism can also cause hair loss. Even if there is no anemia as such, problems in iron metabolism can still lead to hair loss. 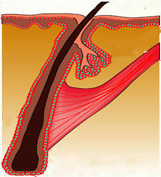 High Cholesterol: High cholesterol is an important cause of hair loss. It leads to decreased blood supply and this causes thinning of hair in the scalp. Hyothyroidism: Low thyroid hormones also cause fall of hair. 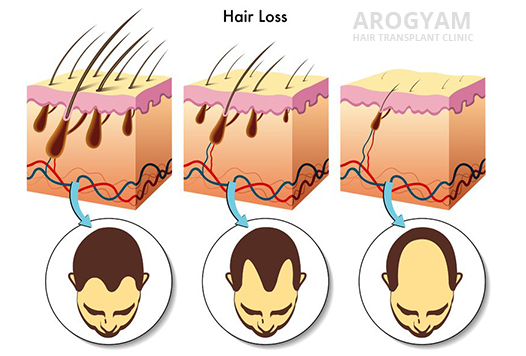 Diabetes: Diabetes can also cause loss of hair because of decreased blood supply to the hair roots. Nutritional deficiency: Nutritional deficiency, specially of Zinc, Biotin and proteins are known to cause hair loss. Alopecia areata: this is an autoimmune condition which causes loss of hair in a small confined region, typically a small circle which has no hair at all. The exact cause of this is not known. Alopecia totalis and Alopecia Universalis: this is a condition when Alopecia areata extends further to cause total hair loss of the scalp (alopecia totalis) and even total hair loss throughout the body including eyebrows, armpits, etc. Pubic hair is conserved till the last in Alopecia universalis. This is a further aggravation of the same autoimmune condition which causes alopecia areata. Scarring Alopecia: Various skin disorders like lupus discoid, scleroderma, etc can cause hair loss but this type of hair loss is accompanied by scarring. All these other causes can lead to hair loss, besides male pattern baldness. More importantly, they can be combined with male pattern baldness and lead to further loss of hair. Hence all this causes must be considered in dealing with a hair loss patient.